Why should you plan so far in advance? Isn’t there a fixed price per station? Shouldn’t the vendor be able to drop a block into a blueprint and call it a day? It’s not that easy. 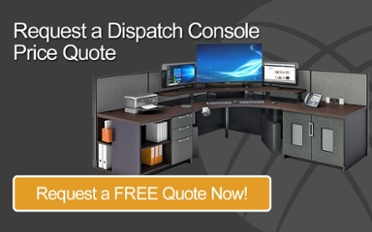 Dispatch furniture in the 21st century is custom made to meet the client’s needs. We need to get room dimensions, equipment information, and storage requirements in order to create a drawing proposal. This data is unique to every Comm Center. Step #1: How Can I Buy? The first step is to get more familiar with HOW your center purchases furniture. It’s best to know this before meeting with a sales representative. If you’re still not sure, the sales representative can usually refer you to a nearby center so that you can hear first-hand advice. Remember, you’ll get solid tips from those who have experience. What is the budget for furniture? When is the budget due? Are there grants available to pay for workstations? Can you purchase off state contracts or another cooperative purchasing group? Do you have to conduct a formal RFP, or can you simply collect three quotes? Can you "sole-source" a vendor or "piggyback" off of a contract? Step #2: Siri, Who Sells Dispatch Consoles? If your purchasing team has given you the greenlight to start getting proposals, the best way to look for furniture is to ask for referrals! See who your neighboring agency uses, or attend your local state conferences to get an idea of who the vendors are in your area. It will probably take a couple of weeks to schedule an onsite meeting with your furniture vendor. Why? The onsite meeting should not only be you and the vendor. It’s best practice to have your IT personnel, dispatch supervisor, and project manager present for the meeting. It can take some time to coordinate a good date for everyone. During the initial meeting, they’ll want to get room dimensions as well as monitor and CPU information. They’ll also want to hear your estimated timeline for completion. Including the time it takes to make revisions and modifications, it can take anywhere from one month to one year to produce a drawing that pleases everyone. This step can take even more time if you’re updating radios or CAD. Monitor sizes and quantities dictate the size of the desk you will need, which is why you see radio/CAD and furniture upgrades happening simultaneously. Your initial proposal might plan for 21” monitors, but later your CAD vendor decides you need a 32” monitor. A bigger monitor usually requires a bigger desk. Once your drawing proposal is complete, you’ll need the quote and the blessing from procurement. Make sure everyone is on the same page with due dates, as every state follows a different fiscal year or budget pattern. Unfortunately, some furniture updates get denied at budget hearings, and you’ll have to wait until next year for the next round. On the plus side, you won’t be scrambling for quotes, as you should have all of your ducks in a row! If you are approved, don’t celebrate just yet! There are some crucial steps needed in order to get the project to completion. After the heavy work of getting the design and quote approved is over, you’ll need to address the finishing touches and tie up the loose ends. The fun part is that there are catalogs of colors to choose from! If you read all of the steps above, we’re sure you’ll agree that you should allow for a little extra time in the planning process when buying dispatch furniture. Two years doesn’t seem like such a long time now, does it? Unlike radios or phones, your dispatch workstations will be custom built, and they will sit in your room for 10–15 years. You might not care about color finishes or comfort controls like fans and heaters when you start the process, but by the time you get to Step #5, you’ll be glad you took your time and didn’t rush into a decision. As we mentioned, if you’re three or more years out from getting new furniture, it might be too soon to start looking. On the other hand, getting a budgetary estimate never hurts, especially in the event you have some money leftover when it’s all said and done. Good luck!